room to room in search of the best and quietest place to be listened to. 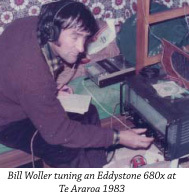 I personally only met Bill on 2 occasions, the first during a mini-DXpedition to Paengaroa in the Bay of Plenty in 1974, where he and ROBIN CHAMBERS showed off a collapsible loop antenna, and demonstrated their DX skills. Then in 1983, Bill and Robin joined us at Te Araroa (East Cape) for a highly memorable DXpedition, along with HARRY WEATHERLEY, JACK SEARLE, MIKE SMITH, DENE LYNNEBERG, TONY MARR, BARRY WILLIAMS & DAVID RICQUISH. using ‘new generation’ transistorised receivers like the Drake SPR-4, when Bill’s venerable Eddystone 680X was delivering audio from Saudi Arabia before the more modern sets. Bill began DXing in 1953 so had a wealth of experience and expertise in the hobby. As a budding DXer, I looked on Bill as one of the best, and always followed his contributions to the ‘DX Times’ with interest. He is a great loss to our hobby and the DX League. Reproduced from the June 2008 DX Times.